See what others are saying about Harmony Hill! October 19, 2018 "California style wine in an unusual location for such quality. The passion of the owners to create California style wine in an unusual location for such quality is impressive. The non-local vines are subject to freeze death after about four nights at or below 15 degrees, making it all the more challenging. They not only do a great job producing fine wines, but also create a nice gathering point on warmer evenings for friends and customers, with entertainment events lasting until early October. Highly recommended!" November 26, 2017 - "A must visit location Please take a leisurely Friday evening or Saturday afternoon in season to visit Bill and Patti at Harmony Hills if you like wine. While it may not be up to the prices of a Silver Oak or Opus One, there wines are pretty darn good and will not break your checkbook. They put a lot of effort and love into what they do and it comes thru on your visit. Feel free to pack a meal with you, though they do sell a few items like cheese plates, etc. Do not bring alcohol of any kind with you as they only have a wine license (do not bring beer or liquors). My favorite is the summer white wines of Concerto and Woodwind, but his reds are good as well. Give Bluegrass and Refrain a try. You will enjoy the entertainment and a nice relaxing few hours. P.S. You might want to bring some chairs with you as frequently they might run out of seating for all present. Enjoy your time while there!!" Reviewed November 27, 2016 - "Fun Diversion Wine Tasting We return to the Harmony Hill Vineyard every Year for the Saturday after Thanksgiving wine tasting. Chat with the very approachable vintner owner; learn about the process and the trials and tribulations. Come away with a reverence for the passion, commitment, the sacrifice and the man. A "burden of dreams." If you have an interest and appreciation for wine you will enjoy the experience. Highest recommendation." Harmony Hills Vineyards is tucked away in a pristine slice of country paradise just outside of Bethel. The sprawling vineyard is a ranch, a farm and a vineyard all in one 70 acre park like setting. The place is simply beautiful. The beauty Harmony Hills has to offer is designed to stimulate all five senses. The picturesque vineyard is a photographers dream. Scenes of sun drenched green fields, perfectly manicured rows & rows of grape vines, painted horses lazily grazing, a bench swing hanging off an ancient oak gently swaying in the summer breeze. Everywhere you look there is something that causes a moment of pause and appreciation for the “harmony” of the sights that fill the eye in any direction. 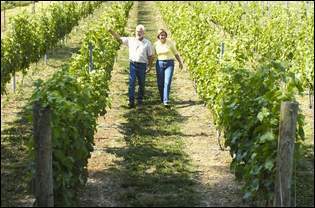 The Wine Trail Traveler, "Harmony Hill Vineyards is a delightful winery to visit outside Bethel, Ohio. Wine lovers, music lovers and families will enjoy a visit to this friendly winery. The winery with many music events is open Fridays, Saturdays and holidays. Bill and Patti Skvarla, owners, are also musicians." "The Skvarla’s unique approach to their own brand of agritourism starts with the rural setting that draws visitors. The Skvarlas have built upon their location with strict attention to detail and landscaping to create a very appealing setting with paver paths, a patio and covered outdoor seating, and live local music." We have to give total credit to Dr. Dan Meakin for this article. Dr. Dan plays at Harmony Hills and last month he invited us up to check out the vineyards and see his solo show. What we found when we arrived was much more than we expected. Harmony Hills Vineyards is tucked away in a pristine slice of country paradise just outside of Bethel. The sprawling vineyard is a ranch, a farm and a vineyard all in one 70 acre park like setting. The place is simply beautiful.